Meet Oso! 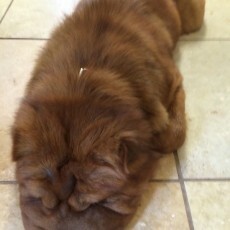 He is a 15 month old neutered purebred Bear Coat Shar Pei. 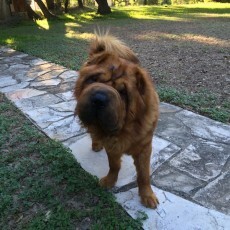 Oso was an owner surrender to rescue after he morphed from a tiny cute wrinkly puppy into 50 pounds of solid muscle. 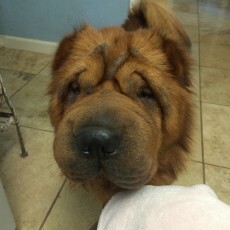 When Oso came into rescue, his eyes were painful and swollen because of entropion (eyelids that roll inward) and allergies from bad nutrition and care. He also had a skin infection and dandruff, and swelling in his legs from food allergies to the food they had been feeding him that made him look like the Michelin Tire Man. Oso had never been trained in any way and jumped wildly on everyone he met. In just two months, with good food and a clean environment, the swelling had all but gone and his skin and coat were shiny and healthy. 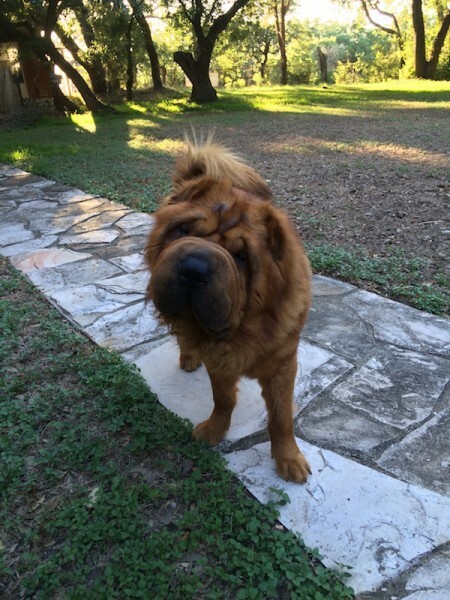 It also turned out that Oso was a very smart dog under all those wrinkles. He quickly learned how to use the dog door, and how to "off", "sit", and "down". He gets along with (mostly ignoring) small non aggressive dogs and is good with large gentle dogs. Ono is typical young Shar-Pei and is very athletic and plays hard so he can be overwhelming for some. Oso would love an active friend who could return his enthusiasm, and run and play with him. He does seem to have a high prey drive and would not do good in a home with cats. Oso needs an owner who will continue his training and keep him busy and engaged. Oso loves human attention and affection. He adores sitting in his foster moms lap on the floor, being petted, and getting his tummy rubbed. He gives the most wonderful smoosh-y kisses ever! Oso has just had entropion surgery to repair his rolling eyelids, is heartworm negative, current on vaccinations and ready for his forever home. Be first in line to adopt Oso...get your application in soon. He's a wonderful young pup just waiting for his forever family.